Centre for Environment and Development Studies at Uppsala University offers a number of courses with a focus on Climate Change Leadership. Climate change leadership is often mentioned in both news media and by politicians themselves, but what does it really entail? What kind of knowledge and skills define a climate change leader and how can they be learned? What kind of political, cultural and psychological resources are lacking in present initiatives? 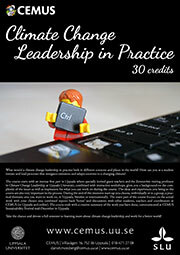 This course discusses the fundamentals of an effective and functioning climate change leadership in a global perspective. Starting out from an analysis of how the climate has changed during the planet’s long geological history and how it plays a central role in the life of the biosphere, the course looks at why there is such a comparatively few effective responses to the issues we are facing. Then the societal and cultural effects of climate change are discussed, looking at how the use of fossil fuel has transformed modern societies and cultures and taking into account broader perspectives such as ethics, justice or gender. 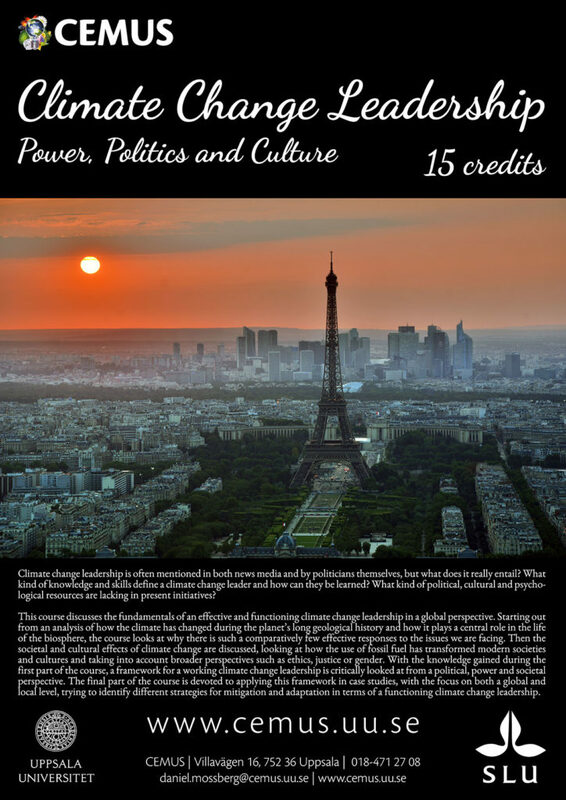 With the knowledge gained during the first part of the course, a framework for a working climate change leadership is critically looked at from a political, power and societal perspective. The final part of the course is devoted to applying this framework in case studies, with the focus on both a global and local level, trying to identify different strategies for mitigation and adaptation in terms of a functioning climate change leadership. The course starts with an intense first part in Uppsala where specially invited guest teachers and the Zennström visiting professor in Climate Change Leadership at Uppsala University, combined with interactive workshops, gives you a background on the complexity of the issues as well as inspiration for what you can work on during the course. The ideas and experiences you bring to the course are also very important in the process. During the end of this intensive start-up you choose, individually or in a group, a practical thematic area you want to work on, in Uppsala, Sweden or internationally. The main part of the course focuses on the actual work with your chosen area combined reports back ‘home’ and discussions with other students, teachers and coordinators at CEMUS (in Uppsala and online). The course ends with a creative summary of the work you have done, communicated at CEMUS Sustainability Festival mid-December in Uppsala. Take the chance and devote a full semester to learning more about climate change leadership and work for a better world. CEMUS at Uppsala University has created a Massive Open Online Course on Climate Change Leadership which so far has run twice (in 2016 and 2017).